For the publisher and grandfather of the author, see George Arthur Plimpton. George Ames Plimpton (March 18, 1927 – September 25, 2003) was an American journalist, writer, literary editor, actor and occasional amateur sportsman. He is widely known for his sports writing and for helping to found The Paris Review, as well as his patrician demeanor and accent. He was also famous for "participatory journalism" which included competing in professional sporting events, acting in a Western, performing a comedy act at Caesars Palace in Las Vegas, and playing with the New York Philharmonic Orchestra and then recording the experience from the point of view of an amateur. Plimpton was born in New York City on March 18, 1927, and spent his childhood there, attending St. Bernard's School and growing up in an apartment duplex on Manhattan's Upper East Side located at 1165 Fifth Avenue. During the summers, he lived in the hamlet of West Hills, Huntington, Suffolk County on Long Island. He was the son of Francis T. P. Plimpton, and the grandson of Frances Taylor Pearsons and George Arthur Plimpton. His grandfather was the founder of the Ginn publishing company and a philanthropist. 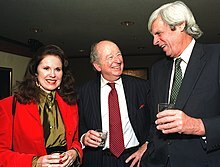 His father was a successful corporate lawyer and partner of the law firm Debevoise and Plimpton who was appointed by President John F. Kennedy as U.S. deputy ambassador to the United Nations, serving from 1961 to 1965. His mother was Pauline Ames, the daughter of botanist Oakes Ames and artist Blanche Ames. Both of Plimpton's maternal grandparents were born with the surname Ames; his mother was the granddaughter of Medal of Honor recipient Adelbert Ames (1835-1933), an American sailor, soldier, and politician, and Oliver Ames, a US political figure and the 35th Governor of Massachusetts (1887–1890). She was also the great-granddaughter on her father's side of Oakes Ames (1804–1873), an industrialist and congressman who was implicated in the Crédit Mobilier railroad scandal of 1872; and Governor-General of New Orleans Benjamin Franklin Butler, an American lawyer and politician who represented Massachusetts in the United States House of Representatives and later served as the 33rd Governor of Massachusetts. George had three siblings: Francis Taylor Pearsons Plimpton Jr., Oakes Ames Plimpton, and Sarah Gay Plimpton. Plimpton attended St. Bernard's School, Phillips Exeter Academy (from which he was expelled just shy of graduation), and Daytona Beach Mainland High School, where he received his high school diploma before entering Harvard College in July 1944. He wrote for the Harvard Lampoon, was a member of the Hasty Pudding Club, Pi Eta, the Signet Society, and the Porcellian Club. He majored in English. Plimpton entered Harvard as a member of the Class of 1948, but did not graduate until 1950 due to intervening military service. He was also an accomplished birdwatcher. Plimpton's studies were interrupted by military service lasting from 1945 to 1948, during which he served as a tank driver in Italy for the U.S. Army. After graduating from Harvard, he attended King's College at Cambridge University in England. He studied there from 1950 to 1952 and graduated with third class honors, BA in English. In 1953, Plimpton joined the influential literary journal The Paris Review, founded by Peter Matthiessen, Thomas H. Guinzburg, and Harold L. "Doc" Humes, becoming its first editor in chief. This periodical has carried great weight in the literary world, but has never been financially strong; for its first half-century, it was allegedly largely financed by its publishers and by Plimpton. Peter Matthiessen took the magazine over from Humes and ousted him as editor, replacing him with Plimpton, using it as his cover for his CIA activities. Jean Stein became his co-editor. Plimpton was associated with the literary magazine in Paris, Merlin, which folded because the State Department withdrew its support.[why?] Future Poet Laureate Donald Hall, who had met Plimpton at Exeter, was Poetry Editor. One of the magazine's most notable discoveries was author and screenplay writer Terry Southern, who was living in Paris at the time and formed a lifelong friendship with Plimpton, along with writer Alexander Trocchi and future classical and jazz pioneer David Amram. Outside the literary world, Plimpton was famous for competing in professional sporting events and then recording the experience from the point of view of an amateur. In 1958, prior to a post-season exhibition game at Yankee Stadium between teams managed by Willie Mays (National League) and Mickey Mantle (American League), Plimpton pitched against the National League. His experience was captured in the book Out of My League. (He intended to face both line-ups, but tired badly and was relieved by Ralph Houk.) Plimpton sparred for three rounds with boxing greats Archie Moore and Sugar Ray Robinson, while on assignment for Sports Illustrated. In 1963, Plimpton attended preseason training with the Detroit Lions of the National Football League as a backup quarterback, and ran a few plays in an intrasquad scrimmage. These events were recalled in his best-known book Paper Lion, which was later adapted into a feature film starring Alan Alda, released in 1968. Plimpton revisited pro football in 1971, this time joining the Baltimore Colts and seeing action in an exhibition game against his previous team, the Lions. These experiences served as the basis of another football book, Mad Ducks and Bears, although much of the book dealt with the off-field escapades of football friends such as Alex Karras and Bobby Layne. Another sports book, Open Net, saw him train as an ice hockey goalie with the Boston Bruins, even playing part of a National Hockey League preseason game. Plimpton's The Bogey Man chronicles his attempt to play professional golf on the PGA Tour during the Nicklaus and Palmer era of the 1960s. Among other challenges for Sports Illustrated, he attempted to play top-level bridge, and spent some time as a high-wire circus performer. Some of these events, such as his stint with the Colts, and an attempt at stand-up comedy, were presented on the ABC television network as a series of specials. In 1994 Plimpton appeared several times in the Ken Burns series Baseball where he shared some personal baseball experiences as well as other memorable events throughout the history of baseball. In the April 1, 1985 issue of Sports Illustrated, Plimpton pulled off one of the greatest April Fools' Day pranks of all time. With the help of the New York Mets organization and several Mets players, Plimpton wrote a convincing account of a new unknown pitcher in the Mets spring training camp named Siddhartha Finch who threw a baseball over 160 mph, wore a heavy boot on one foot, and was a practicing Buddhist with a largely unknown background. The prank was so successful that many readers believed the story, and the ensuing popularity of the joke resulted in Plimpton writing an entire book on Finch. A personal friend of the New England Sedgwick family, Plimpton edited Edie: An American Biography with Jean Stein in 1982. He also appeared in a brief interview footage about Edie Sedgwick in the DVD extra for the film Ciao! Manhattan. In addition, he appeared in the PBS American Masters documentary on Andy Warhol. Plimpton also appeared in the closing credits of the 2006 film, Factory Girl. Between 2000 and 2003, Plimpton wrote the libretto to a new opera Animal Tales, commissioned by Family Opera Initiative, with music by Kitty Brazelton directed by Grethe Barrett Holby. He wrote, "I suppose in a mild way there is a lesson to be learned for the young, or the young at heart – the gumption to get out and try one's wings." Plimpton also appeared in a number of feature films as an extra and in cameo appearances. He had a small role in the Oscar-winning film Good Will Hunting, playing a psychologist. Plimpton played Tom Hanks's antagonistic father in Volunteers. He was also notable for his appearance in television commercials during the early 1980s, including a memorable campaign for Mattel's Intellivision. In this campaign, Plimpton aggressively touted the superiority of Intellivision video games over those of competitors such as the Atari 2600. He hosted Disney Channel's Mouseterpiece Theater (a Masterpiece Theatre spoof which featured Disney cartoon shorts). In the "I'm Spelling as Fast as I Can" episode of The Simpsons, he hosts the "Spellympics" and attempts to bribe Lisa Simpson to lose with the offer of a scholarship at a Seven Sisters College and a hot plate; "it's perfect for soup!" He had a recurring role as the grandfather of Dr. Carter on the NBC series ER. He also appeared in an episode of the NBC sitcom Wings. Plimpton appeared in the 1989 documentary The Tightrope Dancer which featured the life and the work of the artist Vali Myers. He was one of her original supporters and had published an article about her work in The Paris Review. He also appeared in the 1996 documentary When We Were Kings about the "Rumble in the Jungle" 1974 Ali-Foreman Championship fight opposite Norman Mailer crediting Muhammad Ali as a poet who composed the world's shortest poem: "Me? Whee!!" Plimpton was a member of the cast of the A&E TV series A Nero Wolfe Mystery (2001–02). In 2013, the documentary Plimpton! Starring George Plimpton as Himself, directed by Tom Bean and Luke Poling, was released. The film used archival audio and video of Plimpton lecturing and reading to create a posthumous narration. Plimpton was a demolitions expert in the post-World War II Army. After returning to New York from Paris, he routinely fired off fireworks at his evening parties. His enthusiasm for fireworks grew, and he was appointed Fireworks Commissioner of New York by Mayor John Lindsay, an unofficial post he held until his death. In 1975, in Bellport, Long Island, Plimpton, with Fireworks by Grucci attempted to break the record for the world's largest firework. His firework, a Roman candle named "Fat Man", weighed 720 pounds (330 kg) and was expected to rise to 1,000 feet (300 m) or more and deliver a wide starburst. When lit, the firework remained on the ground and exploded, blasting a crater 35 feet (11 m) wide and 10 feet (3.0 m) deep. A later attempt, fired at Cape Canaveral, rose approximately 50 feet (15 m) into the air and broke 700 windows in Titusville, Florida. With Felix Grucci, Plimpton competed in the 16th International Fireworks Festival in 1979 in Monte Carlo. After several problems with transporting and preparing the fireworks, Plimpton and Grucci became the first competitors from the United States to win the event. Plimpton later wrote the book Fireworks, and hosted an A&E Home Video with the same name featuring his many fireworks adventures with the Gruccis of New York in Monte Carlo and for the 1983 Brooklyn Bridge Centennial. A November 6, 1971, cartoon in The New Yorker by Whitney Darrow Jr. shows a cleaning lady on her hands and knees scrubbing an office floor while saying to another one: "I'd like to see George Plimpton do this sometime." In another cartoon in The New Yorker, a patient looks up at the masked surgeon about to operate on him and asks, "Wait a minute! How do I know you're not George Plimpton?" A feature in Mad Magazine titled "Some Really Dangerous Jobs for George Plimpton" spotlighted him trying to swim across Lake Erie, strolling through New York's Times Square in the middle of the night, and spending a week with Jerry Lewis. Plimpton was married twice. His first wife, whom he married in 1968 and divorced in 1988, was Freddy Medora Espy, a photographer's assistant. She was the daughter of writers Willard R. Espy and Hilda S. Cole, who had, earlier in her career, been a publicity agent for Kate Smith and Fred Waring. They had two children: Medora Ames Plimpton and Taylor Ames Plimpton, who has published a memoir entitled Notes from the Night: A Life After Dark. In 1992, he married Sarah Whitehead Dudley, a graduate of Columbia University and a freelance writer. She is the daughter of James Chittenden Dudley, a managing partner of Manhattan-based investment firm Dudley and Company, and geologist Elisabeth Claypool. James and Elisabeth established the 36-acre (15 ha) Highstead Arboretum in Redding, Connecticut. George and Sarah were the parents of twin daughters Laura Dudley Plimpton and Olivia Hartley Plimpton. At Harvard, Plimpton was a classmate and close personal friend of Robert Kennedy. Plimpton, along with former decathlete Rafer Johnson and American football star Rosey Grier, was credited with helping wrestle Sirhan Sirhan to the floor when Kennedy was assassinated following his victory in the 1968 California Democratic primary at the former Ambassador Hotel in Los Angeles. Plimpton died on September 25, 2003, in his New York City apartment from an apparent heart attack. He was 76. An oral biography titled George, Being George was edited by Nelson W. Aldrich Jr., and released on October 21, 2008. The book offers memories of Plimpton from among other writers, such as Norman Mailer, William Styron, Gay Talese and Gore Vidal, and was written with the cooperation of both his ex-wife and his widow. In the movie Plimpton! Starring George Plimpton As Himself, the writer James Salter said of Plimpton that "he was writing in a genre that really doesn't permit greatness." In 2006, the musician Jonathan Coulton wrote the song entitled "A Talk with George", a part of his 'Thing A Week' series, in tribute to Plimpton's many adventures and approach to life. Plimpton is the protagonist of the semi-fictional George Plimpton's Video Falconry, a 1983 ColecoVision game postulated by humorist John Hodgman and recreated by video game auteur Tom Fulp. Researcher and writer Samuel Arbesman filed with NASA to name an asteroid after Plimpton; NASA issued the certificate 7932 Plimpton in 2009. As Told at the Explorers Club: More Than Fifty Gripping Tales of Adventure. Paper Lion (1968) -- Plimpton, played by Alan Alda, is the lead character in the largely fictional film, loosely based on the 1966 nonfiction book. Anecdotally, Plimpton appeared in the film in an uncredited cameo in a crowd scene. Volunteers (1985) – Lawrence Bourne Jr.
Saturday Night Live, as himself, uncredited, 1999 and 2002. In the March 13 episode of Saturday Night Live Season 1, he is one of the audience cutaway shots (usually featured in the early seasons with comedic and fictitious non-sequitur captions as to whom the audience member was, or what they did). He is labelled as having "Roomed with Wendy Yoshimura". A Nero Wolfe Mystery (2001–02) – Member of the repertory cast, playing various roles in "Eeny Meeny Murder Mo", "Over My Dead Body", "Death of a Doxy", "Murder Is Corny", "Help Wanted, Male", "The Silent Speaker" and "Immune to Murder"
Intellivision, pitchman, himself, released by Mattel in 1980. Plimpton was featured in a string of Intellivision commercials and print ads in the early 1980s. Plimpton appears as a character in Philip Roth's novel, Exit Ghost. ^ a b c d e Severo, Richard (September 26, 2003). "George Plimpton, Urbane and Witty Writer, Dies at 76". The New York Times. Retrieved May 25, 2010. ^ Margolick, David (July 31, 1983). "Obituary: Frances T. P. Plimpton, 82, Dies". The New York Times. ^ George Arthur Plimpton profile, findagrave.com; accessed October 26, 2015. ^ Thomas, Jr., Robert McG. (April 17, 1995). "Obituary: Pauline A. Plimpton, 93, Author Of Works on Famed Relatives". The New York Times. ^ He was widely reviled for years after the war by Southern whites, who gave him the nickname "Beast Butler." He is also credited with saving Baltimore, Maryland during the Civil War. ^ Plimpton, Oakes Ames (Spring 2007). "Milton at the Midpoint of the Last Century: One Collection of Memories" (PDF). Milton Academy. Archived from the original (PDF) on May 28, 2010. Retrieved May 14, 2010. ^ "How Failing at Exeter made a Success of George Plimpton". Phillips Exeter Academy Bulletin. Spring 2002. Archived from the original on September 10, 2006. ^ Aldrich, Nelson. George, being George. p. 80. ^ Buttram, Bill (August 19, 1971). "Plimpton trying football again". The Free-Lance Star. ^ Baseball: A film by Ken Burns, PBS, 2010, Retrieved December 27, 2013. ^ "SI Vault – April 1, 1985 – Page 76". www.si.com. Retrieved May 30, 2017. ^ "Legendary Humorist, Poonster Dies at 76 | News | The Harvard Crimson". www.thecrimson.com. Retrieved February 4, 2018. ^ "George Plimpton, Paris Review Founder, Pitches 1980s Video Games for the Mattel Intellivision". Open Culture. Retrieved February 4, 2018. ^ TV.com. "The Simpsons: I'm Spelling As Fast As I Can". TV.com. Retrieved February 4, 2018. ^ Severo, Richard (September 27, 2003). "George Plimpton, Author And Editor, Is Dead at 76". The New York Times. ISSN 0362-4331. Retrieved February 4, 2018. ^ "Professor Muhammed Ali Delivers Lecture; Poems and Parables Fill Talk on Friendship | News | The Harvard Crimson". www.thecrimson.com. Retrieved February 4, 2018. ^ "George Plimpton | Full Film | American Masters | PBS". American Masters. May 16, 2014. Retrieved February 4, 2018. ^ a b c McBride, Stewart (August 13, 1981). "George Plimpton". The Christian Science Monitor. Archived from the original on November 2, 2013. Retrieved November 2, 2013. ^ a b Dowling, Kevin (August 27, 1979). "George Plimpton, Still Burning His Punk at Both Ends, Finds a Sport in Which He Can Sparkle". Archived from the original on November 2, 2013. Retrieved November 2, 2013. ^ a b c d Pile, Stephen (1979). "Two: Off Duty". The Book of Heroic Failures: The Official Handbook of the Not Terribly Good Club of Great Britain. Futura. p. 73. ISBN 0708819087. ^ a b c McBride, Stewart (August 13, 1981). "George Plimpton profile". The Christian Science Monitor. Archived from the original on November 2, 2013. Retrieved November 2, 2013. ^ a b c d Creamer, Robert W., ed. (February 23, 1976). "SI Vault: Scorecard – 02.23.76". Sports Illustrated. p. 4. Archived from the original on November 2, 2013. Retrieved November 2, 2013. But Fat Man sat heavily on the ground, sizzled, smoked and then exploded, leaving a gaping hole 10 feet deep and 35 feet wide. ^ Clarke, Gerald (September 21, 1970). "George Plimpton: The Professional Amateur". Time. ^ Arnie Kogen; Jack Davis (March 1973). "Some Really Dangerous Jobs For George Plimpton". Mad Magazine. 157: 37–39. ^ Curtis, Charlotte (March 29, 1968). "Plimpton Drops Singles for Doubles". The New York Times. ^ Thomas, Jr., Robert McG. (February 25, 1999). "Obituary: Willard Espy, Who Delighted In Wordplay, Is Dead at 88". The New York Times. ^ "Hilda Cole Espy, writer, 83". The New York Times. January 26, 1995. ^ "George Plimpton, Writer and editor, Is Wed to Sarah W. Dudley, a Writer". The New York Times. January 5, 1992. ^ "Obituary: James C. Dudley, 77, Investment Adviser". The New York Times. September 24, 1998. ^ "A Life On The Way To Death". TIME. June 14, 1968. Archived from the original on May 1, 2008. Retrieved April 27, 2008. ^ Ian Buckwalter (May 23, 2013). "'Plimpton! ': A Fond Look At A Man Of Letters". NPR. ^ "A Talk with George – JoCopedia, the Jonathan Coulton wiki". www.jonathancoulton.com. Retrieved May 30, 2017. ^ "Plimpton's Video Falconry". Newgrounds.com. Retrieved May 30, 2017. ^ Arbesman, Samuel (September 27, 2009). "Naming the Sky: The true story of one man's quest to give George Plimpton a permanent presence in orbit". The Boston Globe. Retrieved October 26, 2015. ^ 7932 Plimpton (1989 GP), ssd.jpl.nasa.gov; accessed October 26, 2015. Aldrich, Nelson W. George, Being George: George Plimpton's Life as Told, Admired, Deplored, and Envied by 200 Friends, Relatives, Lovers, Acquaintances, Rivals—and a Few Unappreciative Observers New York. Publisher: Random House, Inc., 2009 ISBN 0-8129-7418-2. Chase, Levi Badger. A genealogy and historical notices of the family of Plimpton or Plympton in America: and of Plumpton in England (1884) Publisher: Plimpton Mfg. Company 1884. Miller, Alice Duer. A History of Barnard College: The First Fifty Years New York. Publisher: Columbia University Press (January 1, 1939). Aldrich, Nelson W.George, Being George: George Plimpton's Life as Told, Admired, Deplored, and Envied by 200 Friends, Relatives, Lovers, Acquaintances, Rivals—and a Few Unappreciative Observers. New York: Random House, 2009. ISBN 0-8129-7418-2. Chase, Levi Badger A genealogy and historical notices of the family of Plimpton or Plympton in America and of Plumpton in England. Plimpton Mfg. Company 1884. Swetz, Frank, J. (1987). Capitalism and Arithmetic. La Salle: Open Court. Walter, Eugene; Katherine Clark (2002). Milking the Moon: A Southerner's Story of Life on This Planet. New York: Three Rivers Press. ISBN 0-609-80965-2. The author describes his years of working with Plimpton in Paris. Plimpton, George (May 31, 1992). "The Smaller the Ball, the Better the Book: A Game Theory of Literature". Books section: Sunday, Late Edition – Final. The New York Times. p. 1. Retrieved March 6, 2010. An essay by George Plimpton. Wikimedia Commons has media related to George Plimpton.